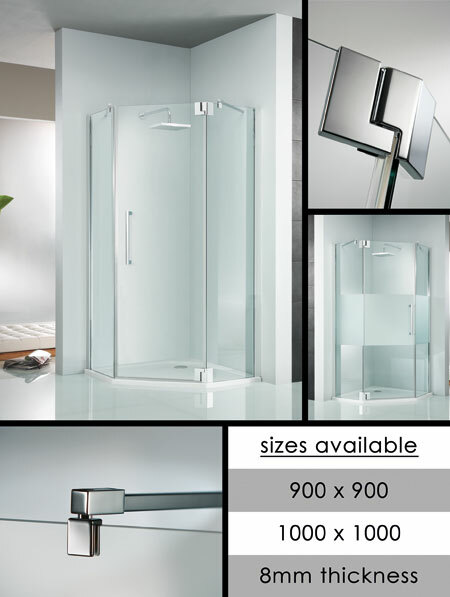 A high quality German contemporary pentagonal shower enclosure.This frameless shower enclosure can be supplied in the 2 sizes of 900mm and 1000mm both 2000mm high and is supplied with pivot opening door. All pentagonal shaped showers are manufactured in rigid 8mm safety glass and can be supplied with a matching low level high quality shower tray. * Price includes shower tray. * Optional privacy frosting strip.